Kevin Greene's IT Blog. This is a blog about all things IT! I don't normally like posting about other people's blog posts but I felt this one is important enough to bend the rules a little for. When installing any System Center product in your environment, you will need to install it's database(s) into an instance of SQL. 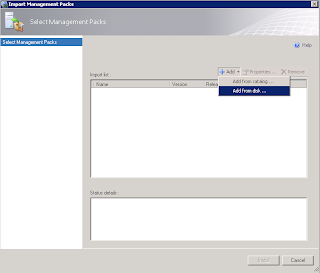 One of the main reasons that I've come across in the past for dysfunctional System Center deployments - particularly SCOM and SCCM - is attributed to an incorrect SQL collation setting being specified during installation. 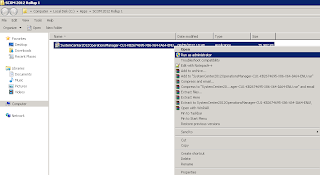 When deploying System Center and when using the English language within your Operating System, you will nearly always want to use the SQL_Latin1_General_CP1_CI_AS collation setting. 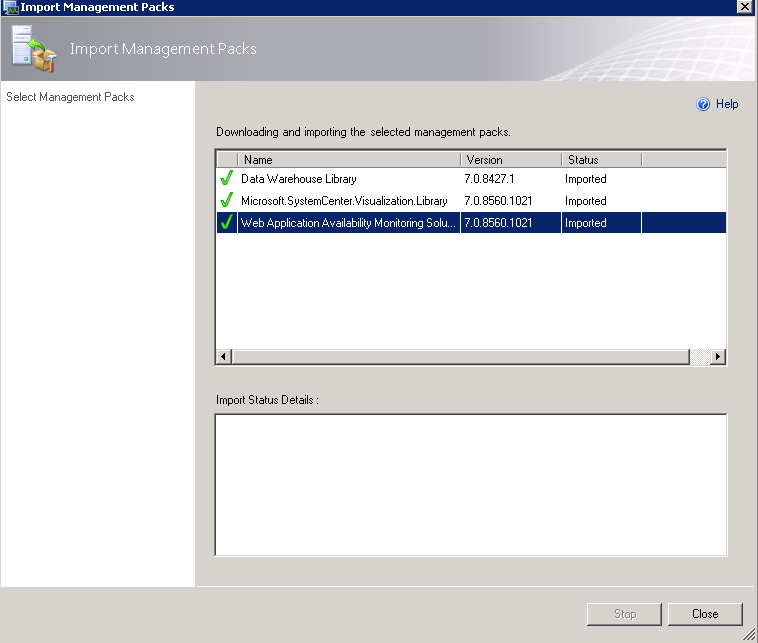 I use the word 'nearly' in the above sentence because after reading an excellent post yesterday from Microsoft's Travis Wright, he explains how Microsoft are starting to move away from this once 'De Facto' standard of SQL collation due to issues around search and data retrieval within the new System Center Service Manager product. Travis also posts a list of the other SQL collation settings that are applicable when not using the English language. 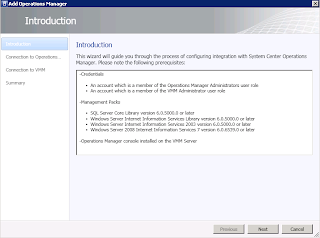 Even though all of System Center 2012 products have the recommended SQL collation configuration built into their Pre-Requisite checks, I'd suggest bookmarking this post for future reference as it can save you or someone else a LOT of time in the future! 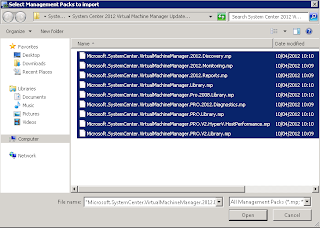 The last few months have been real busy for me with the release of System Center 2012, attending MMS, writing a book and working between all of the different System Center 2012 project deployments that we're involved in. Not to mention trying to make some quality time to spend with the family! In fact, the last year has been pretty much the same story with everything that has gone on and I find myself never having the time to study for and sit the certification exams that I set myself targets for. Nor have I had anywhere near the free time that I would like to have so I can ramp up my skills on the likes of Orchestrator and Service Manager. Still, when new technologies come to market or unusual fixes and workarounds are made public for the products that I deal with on a daily basis, I always seem to be able to quickly find the information I need to enable me to do my job. This is all thanks to the huge amount of community resources that are available to us all every day. It doesn't matter whether your preference is for System Center, Hyper-V, Exchange or Linux - there's always going to be specialists in the relevant disciplines from across the world who love to share their knowledge and experiences with their respective online and local technology communities. These community experts share their information through blogs, central community based websites, forums, Twitter and even by presenting at local user groups and events. Best of all - it's shared completely free! It's with the latter in mind that this week allowed me the opportunity through expert local community resources to attend some excellent sessions on the upcoming Windows Server 2012 and newly released SQL 2012 technologies. Apart from the fantastic technical content on offer, the best part was, the events were completely free! Yesterday I attended the Windows Server 2012 Rocks event in Microsoft Ireland which was presented by Alex Juschin (RDP MVP) and Aidan Finn (Hyper-V MVP). Although this was never going to be a deep dive Level 400 type session (you'd never fit all that info into 4 hours! ), it was perfect to get an overall understanding with some really cool demo's of the new features around managebility, remote access and virtualization that comes out of the box with this release. I left there yesterday with a much better understanding of what we can now do with Windows Server and Hyper-V and more importantly for me, how my future System Center deployments will benefit from all of the new game-changing features. Did I mention that all this is for free? If the Windows Server 2012 event was more for me to brush up on my already pretty good Hyper-V and Server O/S knowledge, then the SQL 2012 Always On Deep Dive event that I've just attended tonight in Microsoft Ireland was purely to help me on the long road to improving my SQL 'Kung Fu' -which by the way, just about get's me out of trouble when I need it to! I realised a long time ago that no matter how good you are at System Center, if you don't know SQL, then you're missing a trick and it's something that is a MUST for anyone deploying System Center 2012. Of course I've earmarked the SQL MCITP exams as ones to sit and pass, but I hardly ever can find the time these days to commit to studying for them! Step forward another community resource in Ireland and that's the SQL User Group run by Niall Flanagan and Bob Duffy. The session this evening was presented by Bob Duffy who's been working on databases since I was still in school! He's an SQL Ranger and also an SSAS Maestro and definitely someone who knows what they're talking about when it comes to databases! The session on SQL 2012 Always On was excellent and the demo's backed up seamlessly what Bob was presenting on and to top it all off, we all got our fair share of pizza's and refreshments. Once again, did I mention that this was all free? The point I'm trying to make I suppose, is that, although as IT Pro's we might get caught up with all of the new technologies being released and the pressure of trying to juggle any spare time we have to get to know and understand them, it doesn't have to cost a load of money on instructer-led training or expensive books - we're in a recession right - to get the knowledge you need to become proficient. Instead, if sometimes, you're prepared to give up a small amount of your own time, then take a look around the Internet and pay attention to your local IT community user groups, you can get expert technical advice from some of the best in the world, right on your doorstep and all for FREE!! That's what I call Community Power! 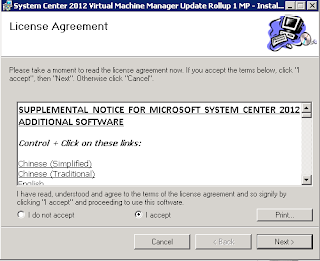 Microsoft has just released their latest cumulative update for SCOM 2007 R2 - CU6. This update hotfix comes with a number of fixes including some I've had in the past in relation to reports failing on Windows 7 and the reporting pane not opening from the console sometimes too. 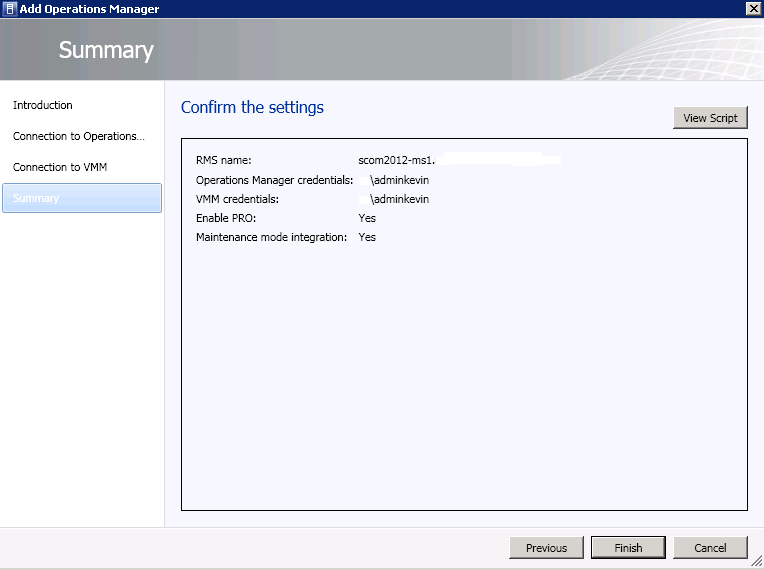 RMS promotion fails if NetworkName and PrincipalNames are not in sync for agents. UI is limited to only 100 MB for the Memory Usage field in the wizard. Additional OIDs in auth certificate are not processed correctly. AEM creates duplicate computer objects in OpsMgr based on Agents NetBIOS name. 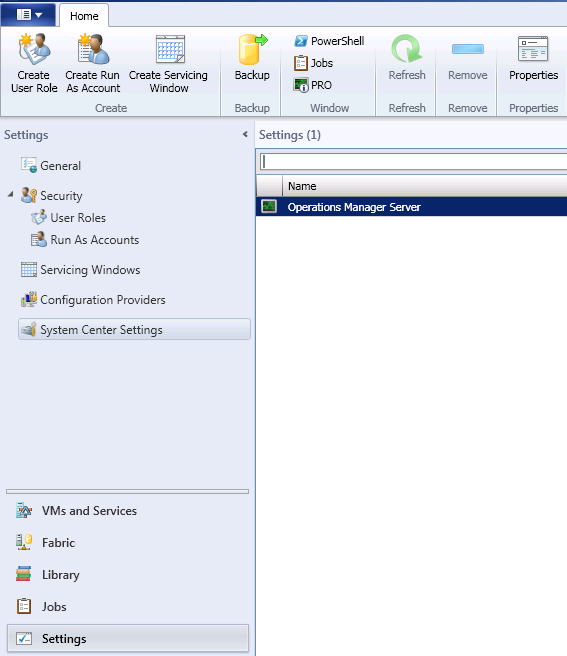 Cannot open reporting pane on OpsMgr 2007 R2 remote console. Cannot view schedule for scheduled report. 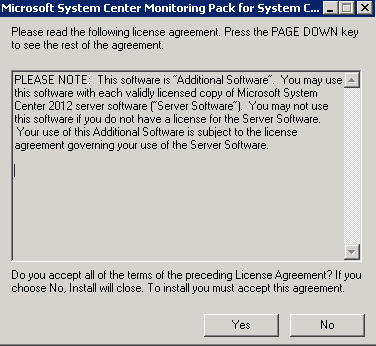 ManagementServerConfigTool with the option "promoterms" fails because it stops polling the SDK Service. 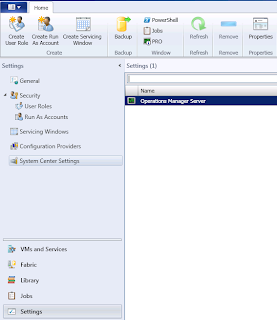 OpsMgr reports are failing on Windows 7 with the error: "Cannot initialize report." ACS events have "n/a" as their category in the ACS database. 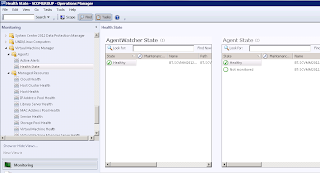 Watch agentless monitoring listener to detect failure to respond. SCOM SDK memory leak on cryptography keys and cryptography contexts. After you click Edit Schedule, a message box appears, and you cannot save the change value. 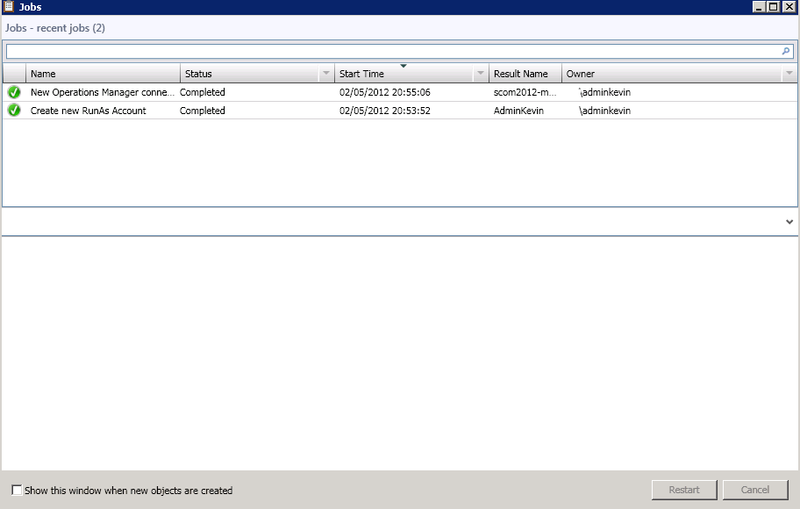 Audit events can be lost when the AdtServer process crashes. 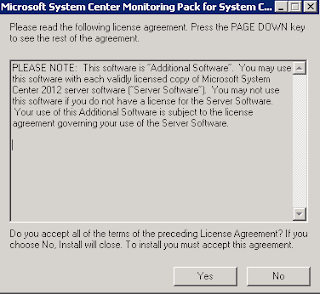 The installation process for the IBM AIX 6.1 agent incorrectly checks for AIX 5.3 packages. 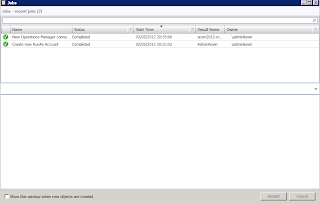 After a system restart, the OpsMgr agent for Solaris may start to run before local file systems are mounted. On Red Hat Linux version 4 and SUSE Linux version 9, LVM disks are not discovered and cannot be monitored. The OpsMgr agent for AIX does not report the arguments for monitored processes. When Microsoft security update MS12-006 is installed on an OpsMgr management server, that management server can no longer communicate with the OpsMgr agent on any Linux or UNIX server. 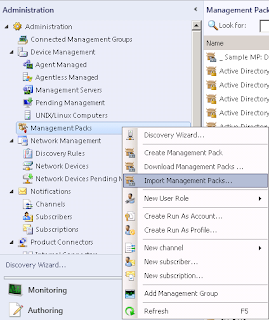 On HP-UX, OpsMgr cannot discover and monitor a logical volume that is composed of more than 127 physical volumes. After spending the last few months involved in writing a book that included a chapter on Systems Management with the Microsoft Operations Framework and Private Cloud components, it's typical that when I finish the writing process that Microsoft have just announced the release of the 'Managing and Operating a Microsoft Private Cloud-How to Apply the Microsoft Operations Framework (MOF) Beta' guide that covers most of what I was trying to research! This guide describes how to manage and operate a Microsoft private cloud using the service management processes of the Microsoft® Operations Framework (MOF). MOF is a framework that helps IT organizations plan, create, operate, and support IT services that deliver expected business value at an acceptable level of risk. The guide assumes an organization has already built an infrastructure-as-a-service private cloud environment based on one of Microsoft’s three private cloud options, using the conceptual architecture and technical components that are recommended. More information about those options can be found in the “Microsoft Private Cloud” section of this guide. The guide applies MOF’s IT service management principles to that conceptual architecture and technology stack. However, the guide’s approach and principles can be applied to any private cloud, regardless of the technology used, with the understanding that the specific technical references will not be relevant. If you have deployed System Center 2012 or are planning on implementing it over the coming months, then this guide is essential reading before you deploy to get you in the correct frame of mind when designing your ITSM processes. With the recent RTM of SCOM 2012, Microsoft have just announced the release of Cumulative Update Rollup 1 (CU1). 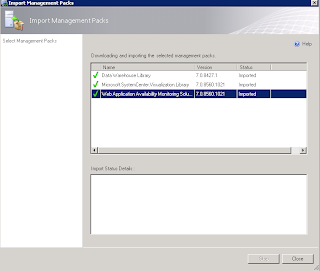 Unlike previous Cumulative Rollups for SCOM 2007 R2 which were over 1GB in size, thankfully this one is only 74MB! The process to deploy the update is quite simple and this time there is no need to run any SQL queries against the SCOM databases as part of the update - as was the case with the SCOM 2007 R2 CU's. 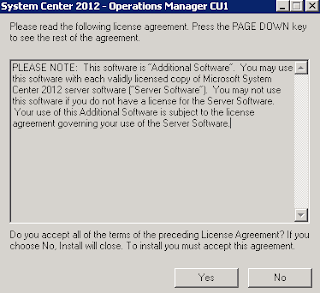 Some of the information below is taken directly from kb 2686249 on the Microsoft Support website. Note: As with all updates, it goes without saying that you should first make a full backup of your SCOM 2012 environment before proceeding with these steps. Note: If Connected MG/Tiering is enabled, the top tier should be patched first. 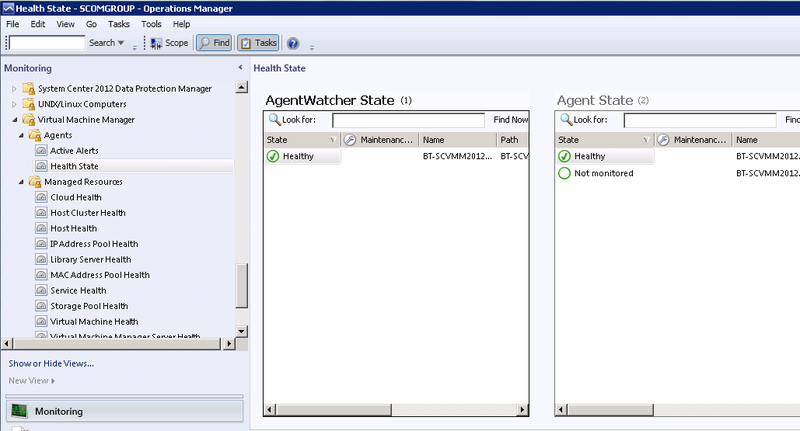 Apply the agent update to manually installed agents, or push installation from the Pending view in the Operations console. 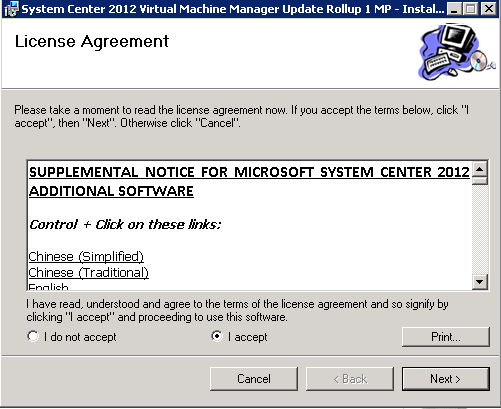 Note: This update rollup can be installed on agents either before or after server infrastructure. On servers that have User Account Control (UAC) enabled, be sure to run these updates from an elevated command prompt as you will most likely receive 'Access Denied' errors when running direct from the GUI. 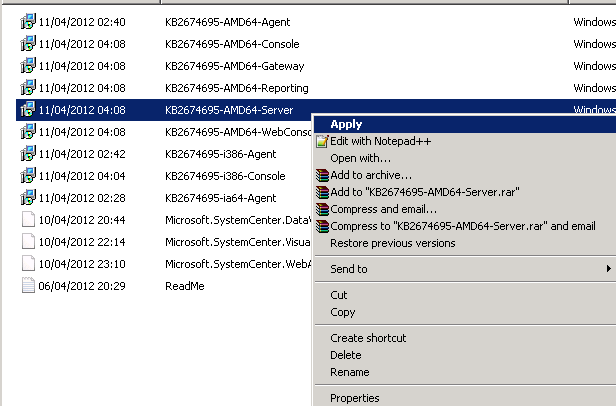 The server I'm installing this to is a single SCOM 2012 Management Server with the Console and Web Console roles deployed so in this instance, I have to install three packages - KB2674695-AMD64-Server, KB2674695-AMD64-Console, KB2674695-AMD64-WebConsole. 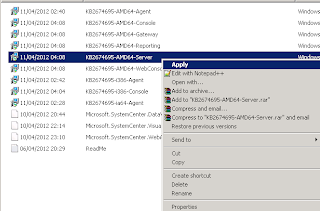 In my environment, I also need to deploy the KB2674695-AMD64-Reporting package to my SQL Reporting Services (SSRS) server and the KB2674695-AMD64-Gateway to my SCOM 2012 Gateway server. 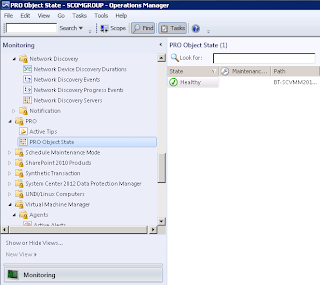 You will see a window similar to the one below open up and run through some processes before automatically closing without any notification or reference to the process being completed. If you don't see the product version updated as above to your files, then your server hasn't updated properly and you will need to revisit the installation to see if you've missed something. Thanks to Shaun Loughton for pointing these updated file names out in his comment below! 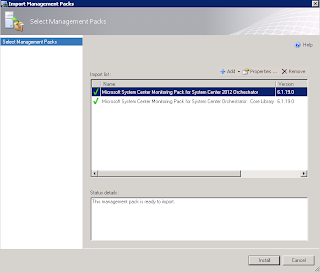 Once you are happy that your first SCOM 2012 Management Server has been updated, then you can then move onto installing the new management packs that come with the CU1 hotfix. Note: You only need to import the updated management packs once. 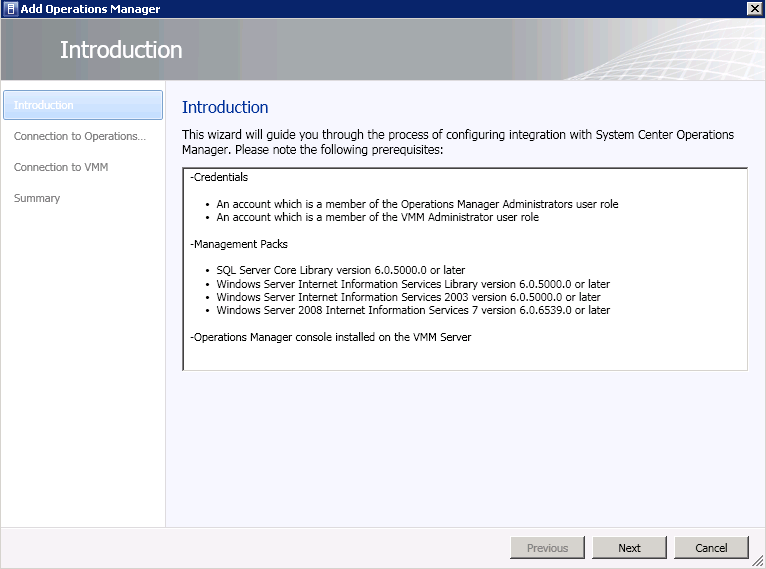 You will not have to carry out this process for every SCOM server role that you upgrade. Although the agent installation upgrade can be carried out at any time, I prefer to wait until I have upgraded my SCOM 2012 server infrastructure first before working on the agents. For any agents that have been manually installed, then you will manually need to copy the .MSP file for the agent to each server and manually carry out each upgrade. 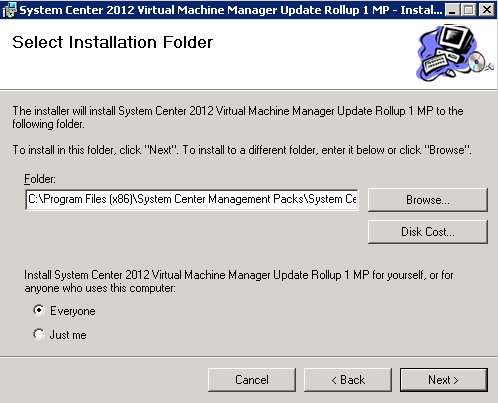 Update Rollup 1 for System Center 2012 Operations Manager contains new agents and management packs for all supported Linux and UNIX operating systems. Therefore, to fully install Update Rollup 1, follow these steps to make sure that your monitoring of UNIX and Linux computers is up to date. 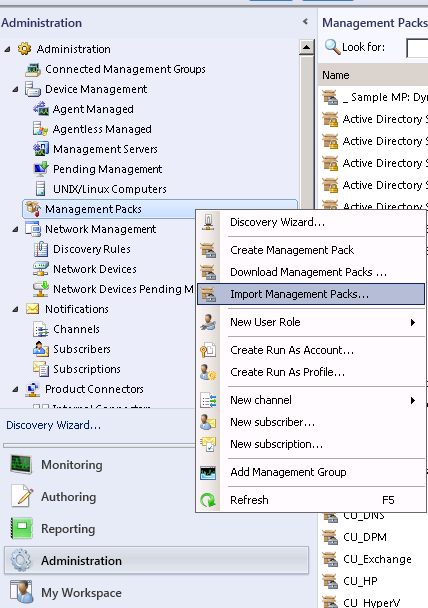 Import the updated management pack for each version of Linux or UNIX that you are monitoring in your environment. Use the Update-SCXAgent Windows PowerShell cmdlet or the UNIX/Linux Agent Upgrade Wizard in the Administration pane of the Operations Console to upgrade each agent to the latest version. The placeholder server type represents the name of the UNIX or Linux server product. The placeholder server version represents the version number of the server type. The placeholder architecture represents the processor architecture of the destination computer. The placeholder package type represents the kind of installation file. That completes the deployment of SCOM 2012 Cumulative Update Rollup 1 (CU1) into your environment. If you are serious about deploying System Center 2012 into your environment, then I suggest you download all of the documentation and updates from these links and get reading and installing as soon as possible! Along with some great deep-dive information to be gleaned from the documentation, there are some additional feature set additions that some of these downloads bring such as Oracle Solaris 11 support in Operations Manager within the first Update Rollup 1. Following on from my previous post on Installing the SCVMM 2012 Update Rollup 1 Management Pack into SCOM, this post will detail the steps required to install and configure the System Center 2012 Orchestrator (SCOrch) Management Pack that will enable you to monitor the health and availability of the SCOrch servers that deliver automation to your environment. Although some people may not think this is a function that they really care about, the focus of System Center 2012 is all about the automation and self-service of your environment and if your main automation server isn't working as expected, then it's defintiely something that you want to know about! 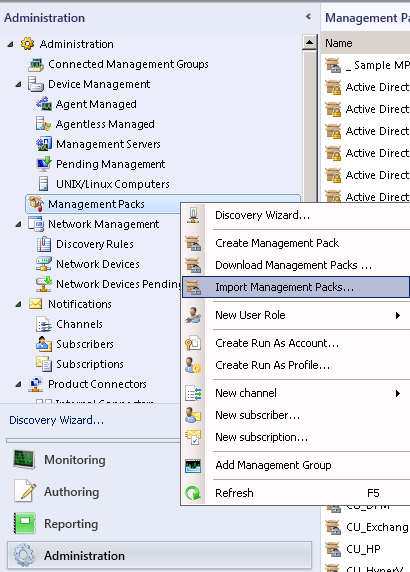 The Windows Server 2008 Internet Information Services 7 Management Pack (version 6.0.6658 or later) must be imported to the management group prior to importing the Monitoring Pack for System Center 2012 - Orchestrator. 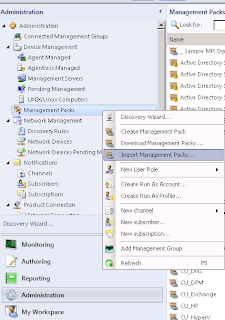 Windows PowerShell is required on Orchestrator Management Servers and Runbook servers. 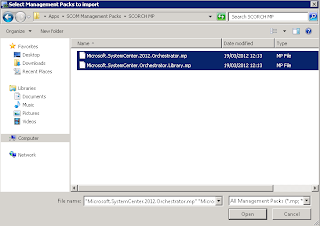 Once you've the MP downloaded to a location on your SCOM 2012 Management Server, browse to the location and run the SC2012OrchestratorMP.EXE file to open up the licence agreement screen and click Yes to continue. 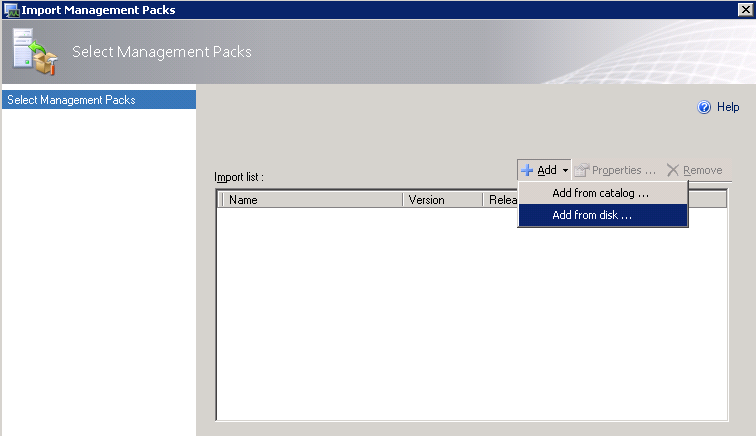 Once the management pack files have been imported successfully, you will see the screen below with a status of Imported for each one. Click on the Close button to exit the window. This completes the installation of the SCOrch 2012 management pack. 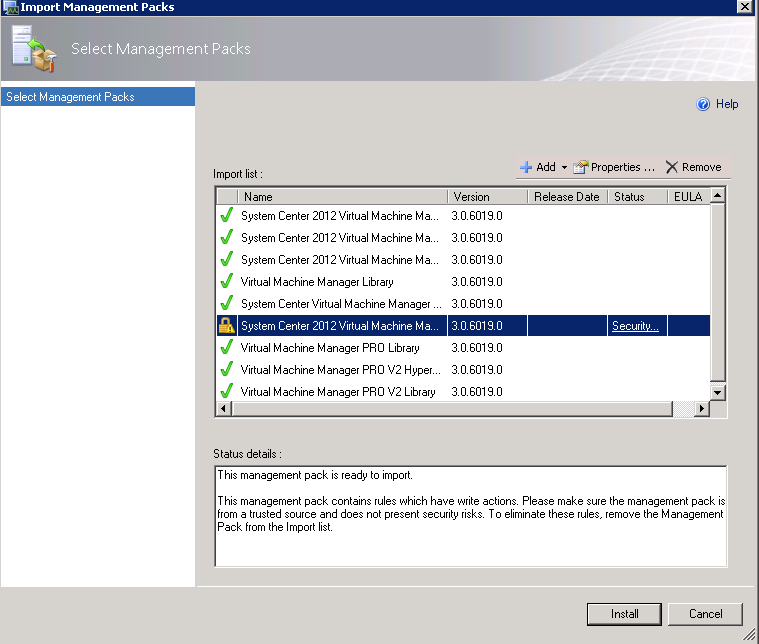 Recently, the System Center 2012 Virtual Machine Manager (SCVMM) Update Rollup 1 Management Pack for System Center 2012 Operations Manager was released and as there are a number of steps that you need to follow to get it working and your SCVMM servers discovered, I thought I'd do up a blog post to cover everything that's needed. 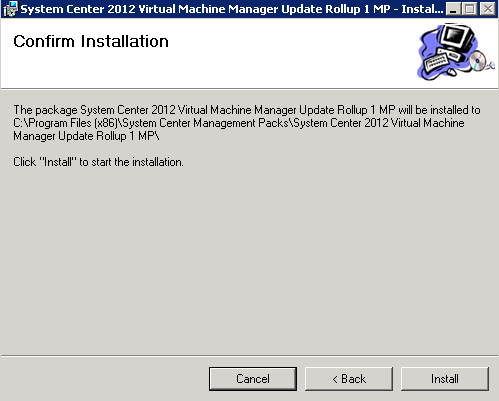 Update 6th June 2012: I've recently ran into some issues when deploying this Update Rollup MP and thought I'd add in some pointers. If you have already integrated your SCVMM 2012 setup with your SCOM environment, then the Management Pack versions in there will be of a lower version than the new ones contained in the Update Rollup 1 Management Pack. 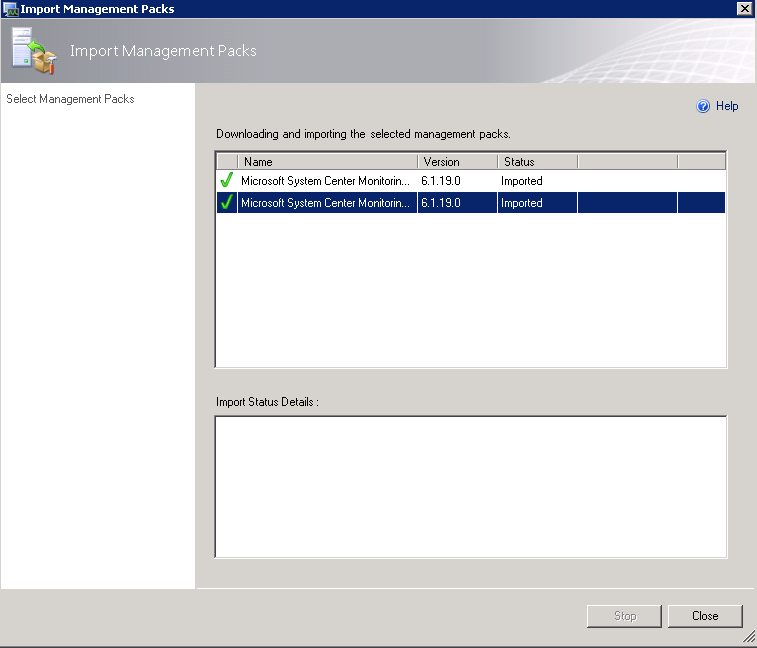 It's because of this that you will need to make a change to a registry key and then re-import/update the existing old MP's back into SCOM. 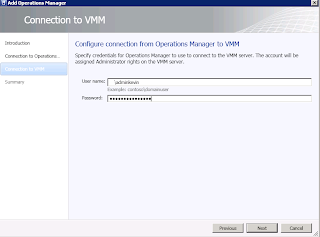 For all this information in detail, firstly, make sure you download the 'OpsMgr_MP_VMM.doc' guide that is provided in the link below and once downloaded, ensure you read thoroughly the 'Mandatory Configuration' and 'Updates to this Monitoring Pack' sections. 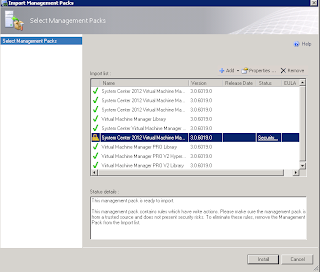 The VMM monitoring pack requires System Center Operations Manager 2007 with Service Pack 1 (SP1), System Center Operations Manager 2007 R2, or System Center 2012 - Operations Manager. 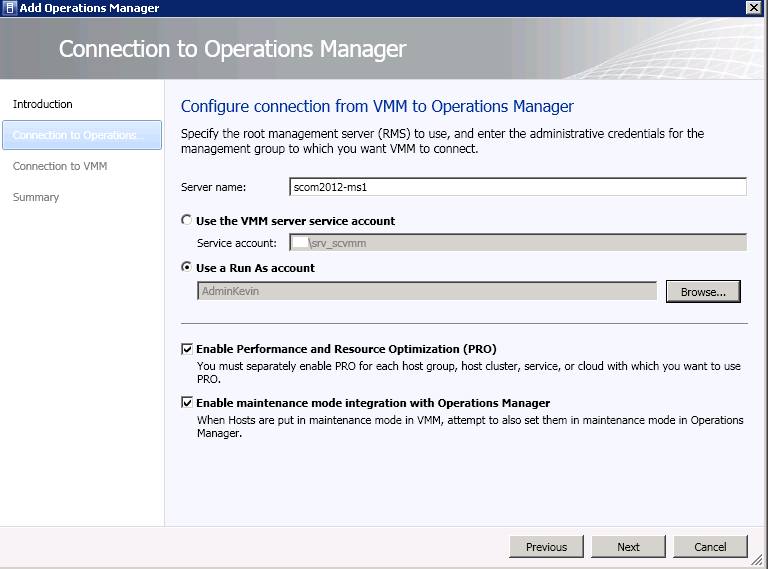 The virtual environment managed by a management server must be monitored by a single management group in Operations Manager. 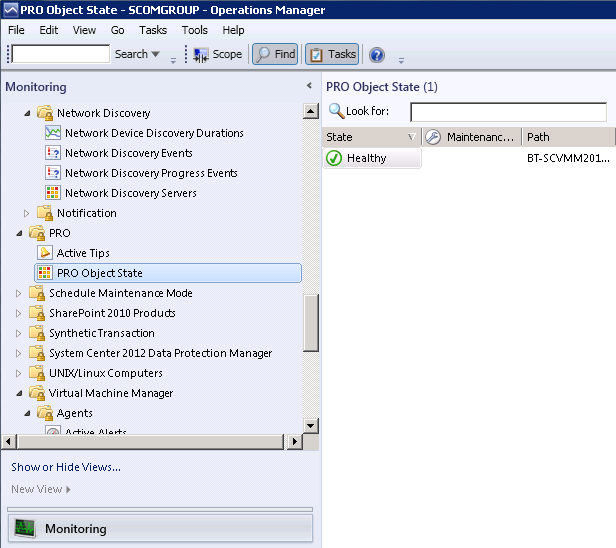 However, an Operations Manager management group can monitor multiple VMM instances. 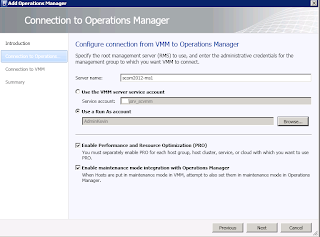 The VMM monitoring pack does not support agentless management of hosts and virtual machines in Operations Manager. 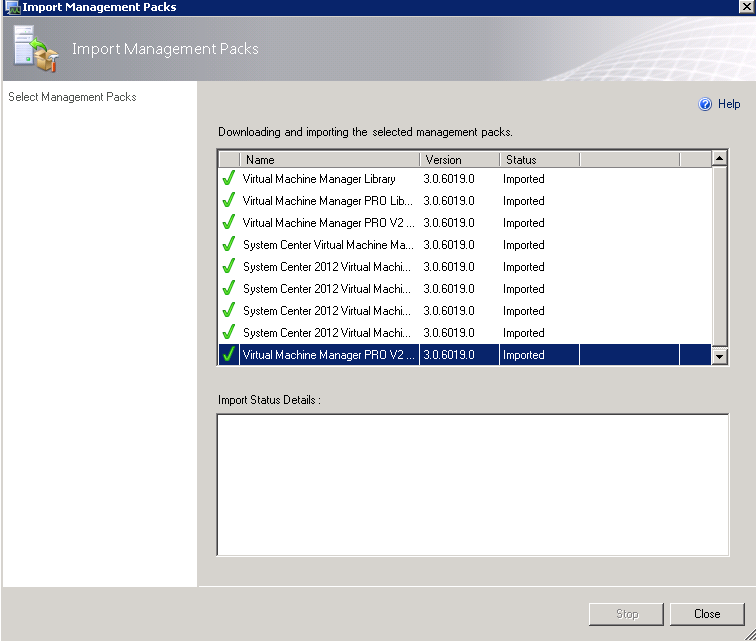 PowerShell 2.0 must be installed on all Operations Manager management servers. 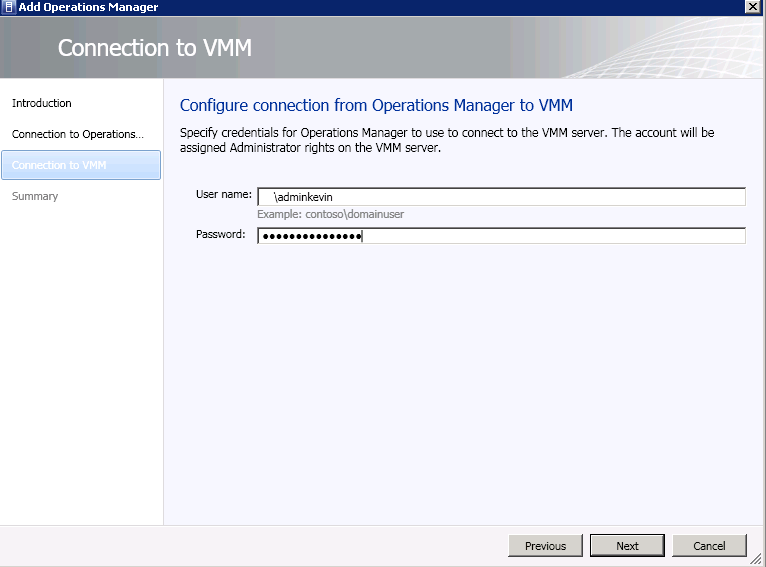 Operations console must be installed on the VMM management server. Note:The version must match the version of Operations Manager. Once all of the pre-requisites are in place, you can go ahead and run the installer for the management pack that you downloaded earlier. 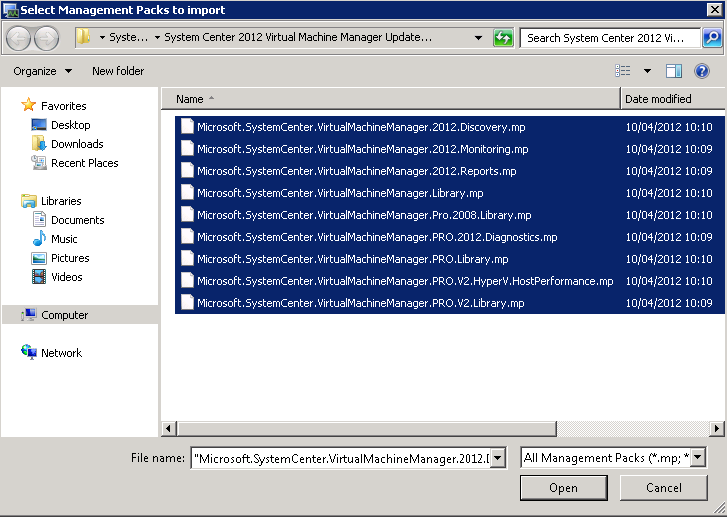 You should now see all of the new SCVMM 2012 management packs listed in the window and ready for installation. Click on the Install button now to continue and choose Yes to acknowledge the security message that pops up. 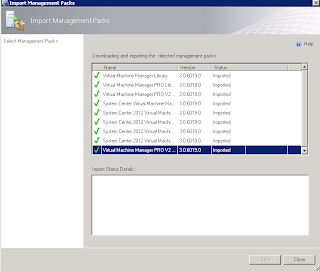 When the import is complete, you should see the screen below showing that all management packs have been imported successfully. Click the Close button to close off the window. Once you have all of the SCVMM 2012 management packs imported into SCOM, you then need to logon to your SCVMM 2012 server and open up the SCVMM console. From within the console, click on the Settings button from the wunderbar, then click on System Center Settings from the Settings menu on the left hand side. 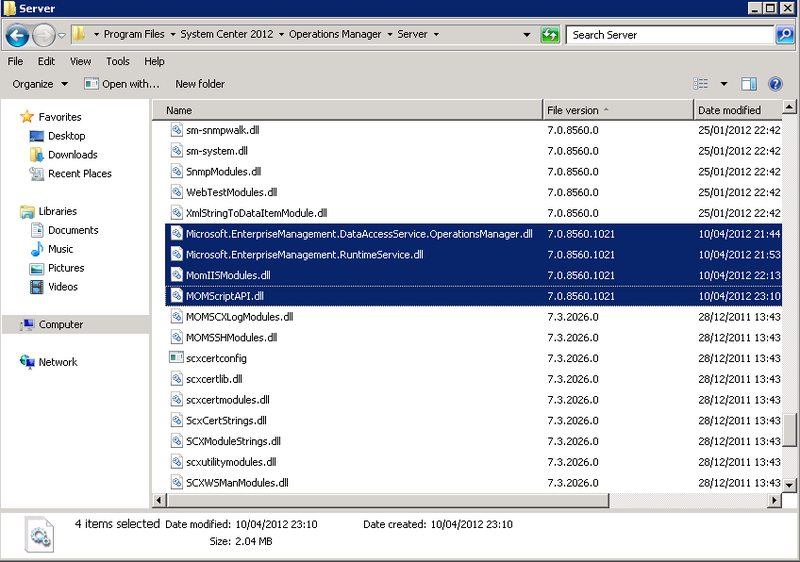 In the central pane, you should see an entry for Operations Manager Server. Double click on this to continue. 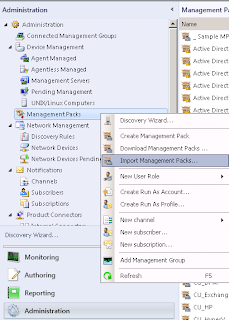 At the Connection to Operations Manager window, type your SCOM Management Server name and choose an account with administrative permissions to your SCOM management group. 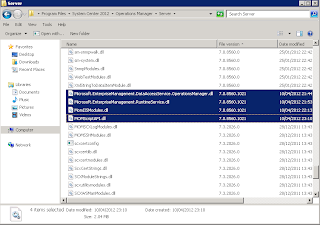 You can create a new Run As Account at this point that will be stored within the SCVMM 2012 security model for future administrative purposes if you wish. Finally, confirm your settings, and click on the Finish button to begin the integration. 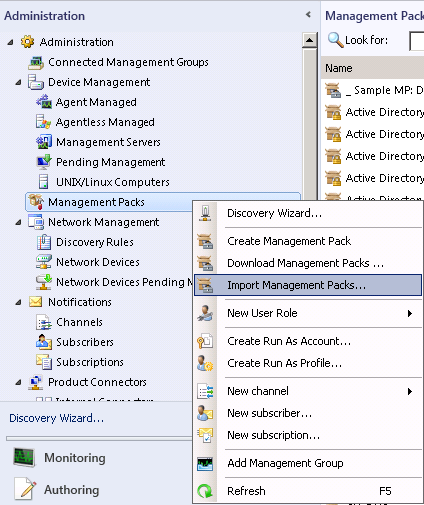 Now all that's left to do is to go back to your SCOM server, open the console at the Monitoring tab and expand the Virtual Machine Manager management pack view folder on the left hand side. Click on the Agent State view, wait a few minutes for the discovery of your newly integrated SCVMM server to complete, and you should then see your SCVMM server's state view similar to the screen below. 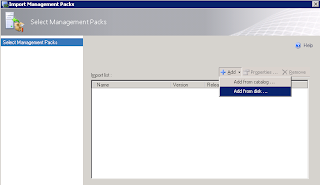 If you chose the PRO option when configuring your integration, you can also then expand the PRO folder from the SCOM console Monitoring window and you should see your SCVMM server and any active PRO tips listed too. 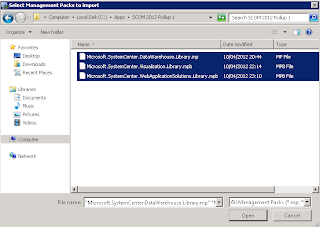 That concludes the installation and configuration of the SCVMM 2012 Update Rollup 1 Management Pack into your SCOM environment. I'm a Microsoft MVP in the Cloud and Datacenter Management space and work as a consultant for Ergo based in Dublin, Ireland. I really enjoy the fact that we are in a constantly evolving industry that requires us to up-skill as much as we can and one that provides us with new products and solutions each year to make the job all the more interesting and ever changing! I'm also lead author of the Mastering Windows Server 2012 R2 and Getting Started with System Center Operations Manager books. Disclaimer: All thoughts on this blog are my own and do not in any way reflect the opinions of my employer. Please verify all information that you read here before making any changes to your systems. 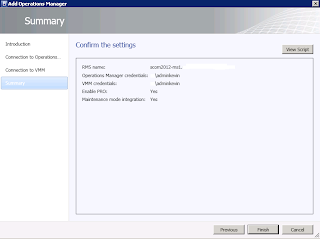 SCOM 2012 - Network Monitoring Magic!